These burgers were created by Andy Windak, and he has a super cute video showing how to prepare these on his website, Windattack. Cut the tempeh in half both lengthwise and thickwise to create 4 equal pieces. Place in a steamer basket unstacked and steam for 10–15 minutes. To make the roasted tomatoes (if using), toss cherry or grape tomatoes in olive oil and place on a baking sheet. Bake at 350 degrees for 15–20 minutes, turning halfway through until soft and juicy. Meanwhile, heat 1 tsp of olive oil in a skillet over medium heat. Add the onions and cook until they start to soften. Add the water and tamari and cook until very soft and the water has evaporated, about 20 minutes. Add the peppers and remove from heat. Using tongs, carefully remove the tempeh from the steamer and place on a plate. Starting with the cut side, pour half of the tamari evenly over the tempeh and rub it in. Flip and coat the other side with the remaining tamari. Push around the plate to make sure all the tamari is absorbed. Evenly sprinkle half of the spices over the tempeh and rub in; flip and repeat with the remaining spices. Heat a large skillet or griddle over medium heat. Add the oil and coat evenly. When hot, but not smoking, add the tempeh. You should hear a nice sizzle. Cook for two to three minutes, filp and cook for another two to three minutes. A nice medium brown color should be achieved on both sides. Toast the bread slices or burger buns and top with desired toppings. 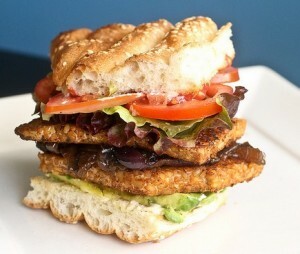 Place a tempeh pattie on each slice of bread and then top with the onions and peppers. Sandwich both sides together and serve.